Chapel Hill Dermatology, P.A .is pleased to offer all of our patients the opportunity to have a complete body skin exam. 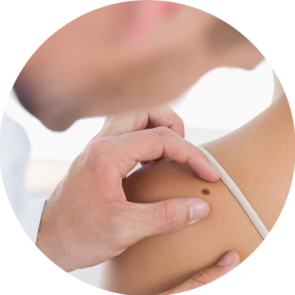 By examining you closely for worrisome moles or skin cancer, we can help to ensure your optimal skin health. Nearly 5 million people in the United States are diagnosed with skin cancer every year. The three most common types of skin cancer, basal cell carcinoma, squamous cell carcinoma, and melanoma are all associated with excessive unprotected exposure to the sun. These skin cancers are usually curable when caught early, so it is important for you to get in the habit of doing regular self-examinations, looking for any new lesions or for any lesion that is changing, itching, or bleeding. All of the providers at Chapel Hill Dermatology, P.A. use a dermatoscope when examining our patients, a cutting edge, non-invasive tool that dramatically improves our diagnostic accuracy when examining any suspicious lesions. Dermoscopy involves using a small hand held instrument, placed directly against a skin lesion, to both illuminate and magnify it. The use of a dermatoscope makes it possible to see deeper into a skin lesion, revealing features invisible to the naked eye. In doing so, we can often better distinguish between benign lesions and skin cancer, often reducing the need to biopsy a lesion and leave a scar. Dermoscopy is also helpful in properly diagnosing inflammatory lesions like eczema, psoriasis, and disorders of the hair. Dermoscopy is one of the many cutting edge tools used at Chapel Hill Dermatology, P.A. to assist us in properly caring for your skin. Rashes can appear on your skin as red, itching, scaling, blistered, irritated, or painful patches. A rash can be a sign of many different medical problems, and may be localized or widespread. Some rashes develop quickly, while others may evolve over days to weeks. Although most rashes can be cleared up fairly quickly, some rashes are long lasting and require ongoing therapy.Skin rashes can be caused by allergic reactions (poison ivy, drug eruptions), chronic irritation or dryness, a genetic predisposition (psoriasis, atopic dermatitis), infection (boils, shingles, fungus, scabies), or can be a sign of more serious internal disease (lupus, kidney or liver disease). 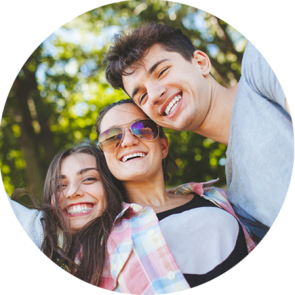 Chapel Hill Dermatology’s experienced, empathic providers will take the time to listen to your concerns and put all of the pieces of the puzzle together to arrive at a diagnosis and treatment plan that works for you. For any difficult cases, we do not hesitate to consult with one another to ensure that you receive the best possible care. Chapel Hill Dermatology, P.A. welcomes younger patients, including newborns, toddlers, pre-teens and teens to our practice. We are experienced in treating the most common skin conditions seen in this age group. Acne, atopic dermatitis/eczema, diaper dermatitis, birthmarks, warts, molluscum contagiosum, impetigo, contact dermatitis, hemangiomas, and hair or nail disorders are just some of the conditions that we are skilled at treating. We understand that an unhurried approach is necessary to minimize anxiety in both child and caregiver, and we use age-appropriate explanations for each situation. We value your involvement in any decisions that need to be made about your child’s care and welcome any of your questions. When needed, we employ a state-of-the-art, non-invasive visual diagnostic tool, called dermoscopy, to enhance the accurate diagnosis of nevi and other skin lesions. If an in-office procedure, such as a skin biopsy, is necessary to make a diagnosis, we strive to make sure your child’s visit is as stress-free and painless as possible. Your skin provides an effective barrier between you and the outside world. However, at times, this barrier function can be compromised, and your skin can get infected with a variety of bacterial, yeast, fungal, viral, or parasitic organisms. Hair and nails may sometimes be infected, too. Staph. aureus bacterial infections may appear as small red pustules on your skin, or as larger, more tender nodules. Yeast infections may cause inflammation in your skin folds, or under your nails. Fungal infections may appear as athlete’s foot, “jock itch”, or cause thickened and distorted nails. Viral infections like cold sore virus can cause blisters to appear in infected areas, and the chicken pox virus may appear later in life as a painful band of blisters, known as “shingles”. Parasitic infections with lice may cause itching of the scalp, and infection with the scabies mite can cause all-over itching. Our providers are experts in the diagnosis of infectious skin diseases and will formulate a treatment plan to clear your infection. Dermatologists specialize in the diagnosis and treatment of disorders of the skin, hair, and nails. Hair disorders can be caused by a variety of factors, including: genetics, hormonal abnormalities, aging, stress, infections, autoimmune diseases, and systemic disorders (like iron deficiency, thyroid disease, or an adverse reaction to a medication). Whether you are suffering from male or female pattern hair loss, unexplained thinning of your hair, or excessive hair growth, our providers can help determine the underlying cause and offer you an appropriate treatment plan. Nail disorders can also have many causes, including: genetics, fungal, bacterial, or yeast infections, allergic contact dermatitis, trauma or injury, benign or malignant growths under the nail plate, and other skin diseases (like psoriasis). In some cases, nails can become painful, deformed, and discolored. After a thorough exam, we will discuss the source of your nail disorder with you and review any treatment options. Turning back the clock just became easier than ever before.